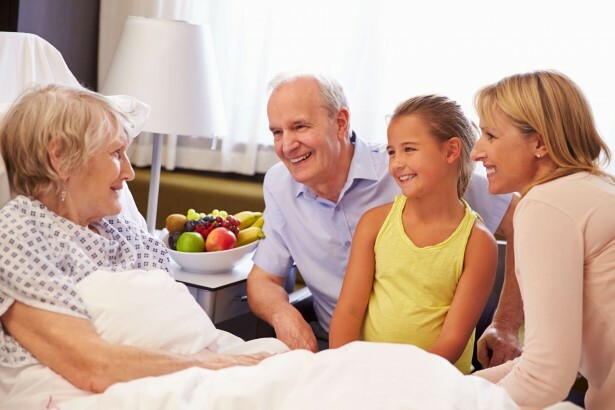 Having visitors while in the hospital is an important aspect of recovery and recuperation for many people, and hospitals each have their own policies for allowing visitors to see patients where appropriate. For many patients, seeing the right visitors can greatly reduce the stress and anxiety of their situation. However, it must always be up to the patient as to whether they want to see visitors. Hospitals must respect patient’s wishes, while visitors must respect hospital policy. When you are a patient in the hospital, it is important that you put your needs and wants first – as long as you aren’t acting against your doctor’s advice. Your hospital stay is about your own personal treatment and recovery. If you feel that having visitors, or having certain visitors, will get in the way of that, it is OK for you to say so. You have the right to refuse to see anyone from outside the hospital who you feel could cause you distress. If this is the case, you should make sure to tell the nurse unit manager of the ward you’re staying on. They will then communicate your wishes to the rest of the nursing staff. If you would prefer not to have any visitors at all, you should inform the relevant people, so they don’t make the journey to see you, only to be turned away when they arrive. If you are faced with a visitor who is refusing to leave, despite your insistence, security staff have the authority to remove them. Don’t be afraid to let staff know if you feel at all threatened or uneasy. Whenever a doctor or nurse needs to speak to you, examine you, or administer treatment, you can ask your visitors to step outside. For patients, a hospital is supposed to be a place where they can receive treatment and recover from illness or injury. You should always remember this when you are planning your hospital visits to see them. Make sure that you check with the hospital what their patient policy is, as well as ensure that the patient is well enough to receive visitors. You should also remember that hospital schedules are often inflexible, meaning that patients may be out of room for examinations and procedures at inconvenient times. Many hospitals do relax their visitor policies in some circumstances, but you should always remember that they have other priorities. Check ahead on the day you plan to visit and coordinate your visiting hours with other visitors. Many hospitals will have restrictions on the number of visitors a patient can see at one time. This is for the benefit of the patient, so it is important that you adhere to it. In some cases, you might have to wait until other visitors have left, so that the ward doesn’t become overcrowded. When you arrive at the hospital, you should ask the staff in the main administration area to direct you to the correct room. The administration area will usually be by the main entrance. They will also be able to help you with any other enquiries you might have. You should also check with staff at the nursing station or reception to be certain that it is OK for you to visit the patient. In many hospitals, visitors are asked to clean their hands when they arrive to limit the spread of infection. Remember that many patients in the hospital will be more susceptible to infection than usual. It is, therefore, very important that you observe any such precautions. Hospitals throughout the State of Victoria have waterless hand-wash stations for visitors to use. However, even with these in place, it is important that anyone who feels unwell or may have been exposed to a bacteria or virus, stay away from the hospital. You should also wash your hands when you leave the hospital, to ensure that you aren’t carrying any infections with you. Hospital visiting hours will vary from hospital to hospital. In many cases, there will also be different visiting hours for the different wards. Be sure to check with the hospital you are visiting as to what their particular policy is. In most hospital intensive and special care units, including neonatal intensive care, there will likely be restrictions on the visiting hours, such as only allowing immediate family and restricting the amount of time they can spend there. Children’s hospitals usually have more flexible approaches to visiting hours for parents of carers. Lots of hospitals allow visitors from 10 am to 8 pm, although many also have a rest period in the middle of the day. You should also be aware that many hospitals don’t allow visitors during mealtimes. As a security measure, many hospitals lock external doors once visiting hours are over. This is important for the protection of patients and personal belongings. In the case of child patients, only parents and carers can stay on the ward after hours. In exceptional circumstances, the nurse unit manager might allow designated visitors to be present on the wards outside of visiting hours. You should check with the nursing staff if this is possible - if its something you think will help. You should investigate the parking and transport options of the hospital you plan to visit well ahead of time. If you can’t find the information that you need, phone the hospital’s front desk and ask. If you will be driving yourself, try and scout out the route ahead of time. Gifts can be a great way of raising a patient’s spirits, and of giving them something to do while they are stuck in the hospital. However, there will be some restrictions, as you would expect. Many hospitals will not allow any pot plants in high-dependency wards or surgical areas. Flowers are usually OK but are often not permitted on intensive care wards. Alcohol is not permitted in hospitals, and many also have restrictions on certain foods. If you plan on bringing flowers for a patient, you should also consider bringing a vase or container for it. Otherwise, if one is not available, the flowers might end up presenting a problem. As always, check ahead with the hospital to find out what their particular policy is. There are a number of other things you can do to show consideration for other patients when you are visiting a hospital. • Make sure that the patient is happy to have you there. • Make sure that you consider the needs of any other patients who are sharing a room with the patient you are visiting. Try and keep the noise down as much as you can when in the patient’s room. Lots of hospitals have dedicated family areas for those who need privacy. • Remember that the role of staff is to attend to patient’s medical needs, not the needs of visitors. • There may be times when you are visiting a patient and they require some additional privacy. If this is the case, you should be prepared to step out and come back later. • If you bring children with you, make sure that you are prepared to supervise them. • Smoking is not permitted in any hospital in Victoria. • Be prepared for the condition of the person you are visiting; some visitors are shocked to see their loved ones when they are hospitalised. • Respect the individual policies of the hospital. • Remember that patients are often in low spirits, your visit should help to raise them. If you follow these guidelines, your visit should pass without incident.